Last week, I started re-reading a classic in the e-Learning literature, Clark and Mayer’s e-Learning and the Science of Instruction. In Chapter 12: Does Practice Make Perfect?, the authors outlined six principles for practice. I will highlight Principle 3: Provide effective feedback. I have written here before on feedback (see the posts Three Types of Feedback and Practice + Feedback = Improved Learning Outcomes). What I got from Clark and Mayer’s take on practice feedback, that I have not seen, was the tip to avoid phrases that “draw attention to the ego and away from learning” (p. 267), such as “Well Done!” (p. 267), “Good job!”, “Nice work”. The tip struck me because I have been the recipient of such phrases and have written those phrases in feedback to my students. Clark and Mayer wrote that practice feedback should be explanatory, assisting learners in building appropriate “mental models” (p. 263). 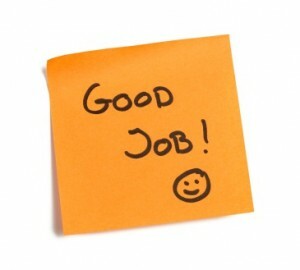 Using a phrase such as “Good job” or “Well done” may make the student feel good about himself or herself; however, when the phrase is used in isolation– without specific explanatory feedback on what was done well or what was good about the response, product, or presentation–it misses an opportunity to provide the learner with information on the specific knowledge, skills, or competencies that are accurate and should persist in future work. Likewise, practice feedback for an incorrect response that does not provide explanatory feedback, that is feedback that stops at merely informing the learner that a response is incorrect but does not tell the learner what is incorrect and how the response may be improved, misses a “teachable moment” (p. 263) for the learner. In conclusion, telling a learner that the work he or she produced is good is OK, or telling a learner that his or her work is incorrect is OK, but failing to tell the learner what makes the work good is NOT OK, and failing to tell the learner what is wrong with incorrect practice work and how to improve it is NOT OK. Remember to provide explanatory feedback. See the post Three Types of Feedback, for descriptions of adequacy, diagnostic, and corrective feedback, from Robert Mager’s book Making Instruction Work. Author WilletteBPosted on 04-11-2018 Tags e-Learning and the Science of Instruction, feedback, practice, Richard Mayer, Ruth ClarkLeave a comment on Good Job!